Android is a major step towards an ethical, user-controlled, free-software portable phone, I believe Android will be stronger in the developing world than it is in the developed world. 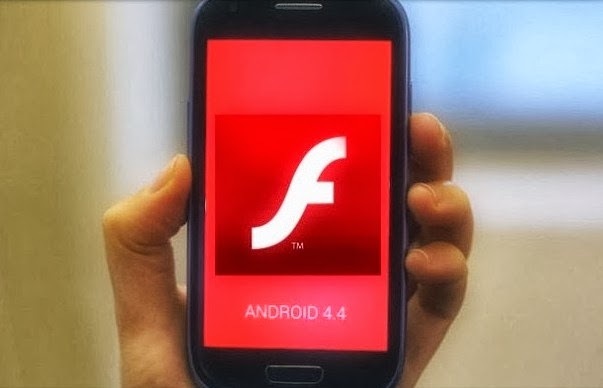 Most of you that recently purchased a Nexus 5 or any android OS of 4.4 Kitkat or even updgraded their old android OS to 4.4 kitkat would notice that it no longer supports flash player due to some certain changes. Of course you should know how fustrating it is, with the lack of flash player. 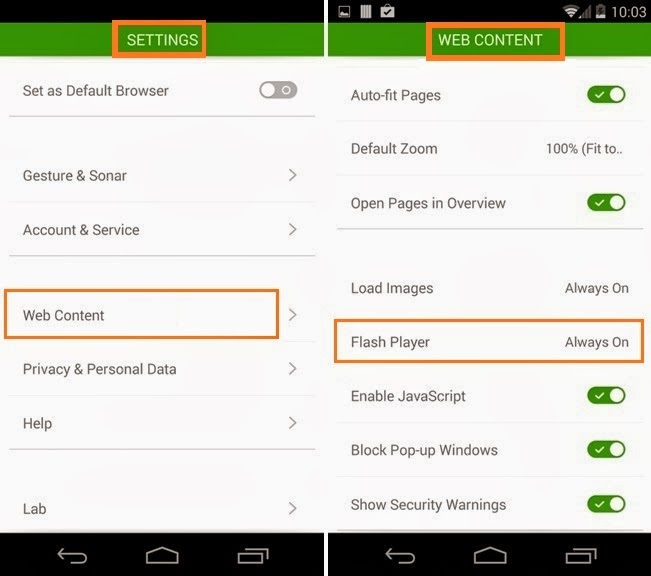 Flash player is of good importance to our androids unlike helps in streaming of flash contents through browsers. 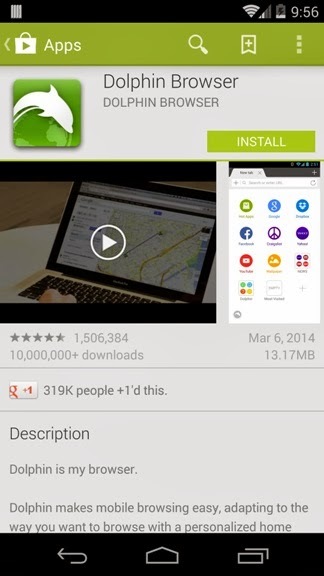 Today's stroll, I would be breifing on how to install flash player on Android 4.4 Kitkat Smartphone. 1. 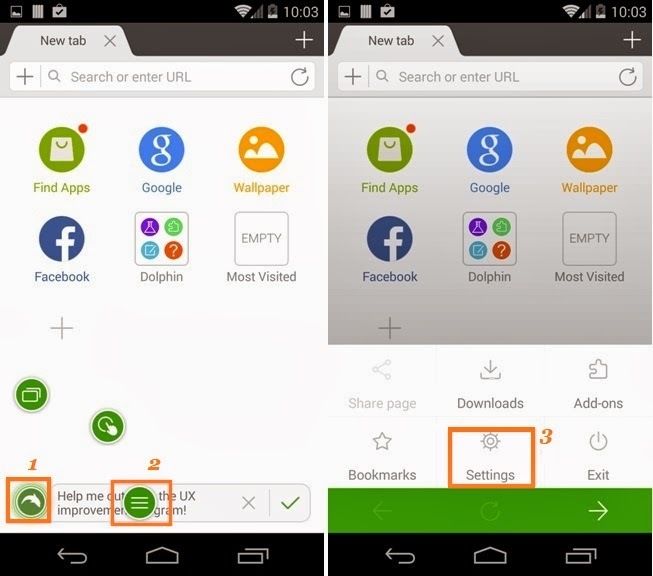 First download Dolphin Browser and install on your android device. 2. Run the dolphin and navigate over to setting menu through tapping the transparent dolphin logo on the left buttom and the select the first icon from the right. A menu pops up would display through which you are to tap settings option from the screenshot given below. 3. Through the settings page, simply navigate over to web content and set flash player plugin to Always on. 4. Finally, download this modified Flash player version from here and install on your device that the above setup was being made on. Kudos! Once this is done, you can then stroll to any flash based website and browse through with the use of dolphin browser. Hope you found this tutorial helpful. I would love your comment and shares. Less I forget, I would appreciate if you do join my blog readers, for all future updates on mobile tips would be sent directly to your email. To join, Click Here.